Background Change in the prevalence of asthma-like symptoms in populations of ageing adults is likely to be influenced by smoking, asthma treatment and atopy. 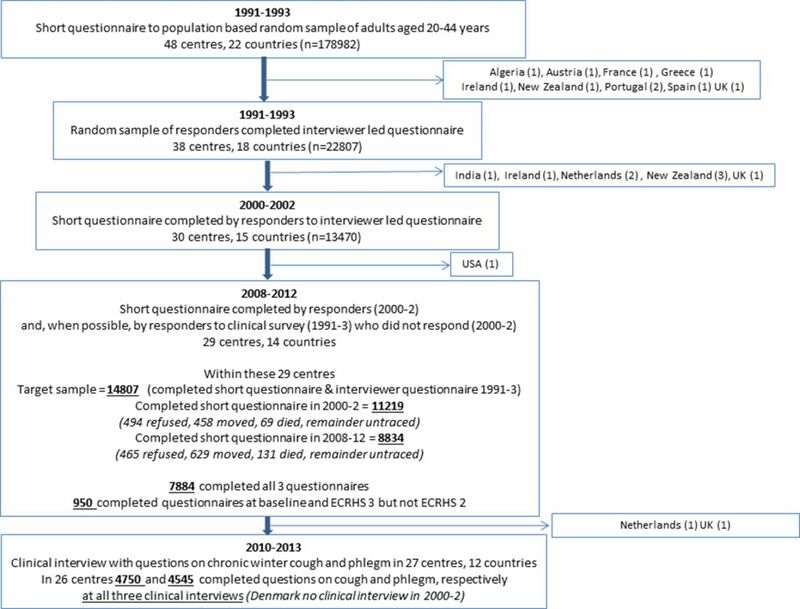 Methods The European Community Respiratory Health Survey collected information on prevalent asthma-like symptoms from representative samples of adults aged 20–44 years (29 centres in 13 European countries and Australia) at baseline and 10 and 20 years later (n=7844). Net changes in symptom prevalence were determined using generalised estimating equations (accounting for non-response through inverse probability weighting), followed by meta-analysis of centre level estimates. Findings Over 20 years the prevalence of ‘wheeze’ and ‘wheeze in the absence of a cold’ decreased (−2.4%, 95% CI −3.5 to −1.3%; −1.5%, 95% CI −2.4 to −0.6%, respectively) but the prevalence of asthma attacks, use of asthma medication and hay fever/nasal allergies increased (0.6%, 95% CI 0.1 to 1.11; 3.6%, 95% CI 3.0 to 4.2; 2.7%, 95% CI 1.7 to 3.7). Changes were similar in the first 10 years compared with the second 10 years, except for hay fever/nasal allergies (increase seen in the first 10 years only). Decreases in these wheeze-related symptoms were largely seen in the group who gave up smoking, and were seen in those who reported hay fever/nasal allergies at baseline. Interpretation European adults born between 1946 and 1970 have, over the last 20 years, experienced less wheeze, although they were more likely to report asthma attacks, use of asthma medication and hay fever. Decrease in wheeze is largely attributable to smoking cessation, rather than improved treatment of asthma. It may also be influenced by reductions in atopy with ageing. Has the prevalence of asthma-like symptoms changed in populations of young adults as they have aged? In young adults followed for 20 years, the prevalence of asthma, use of asthma medication and self-reported hay fever/allergic rhinitis has increased, although, largely related to smoking cessation, the prevalence of wheeze has fallen. This prospective survey which includes follow-up data on adults collected over the last 20 years provides unique European-wide information on the evolution of asthma-like symptoms in adults as they have aged. There are few population-based longitudinal studies which have described the evolution of the burden of respiratory symptoms and disease in populations of adults as they age. 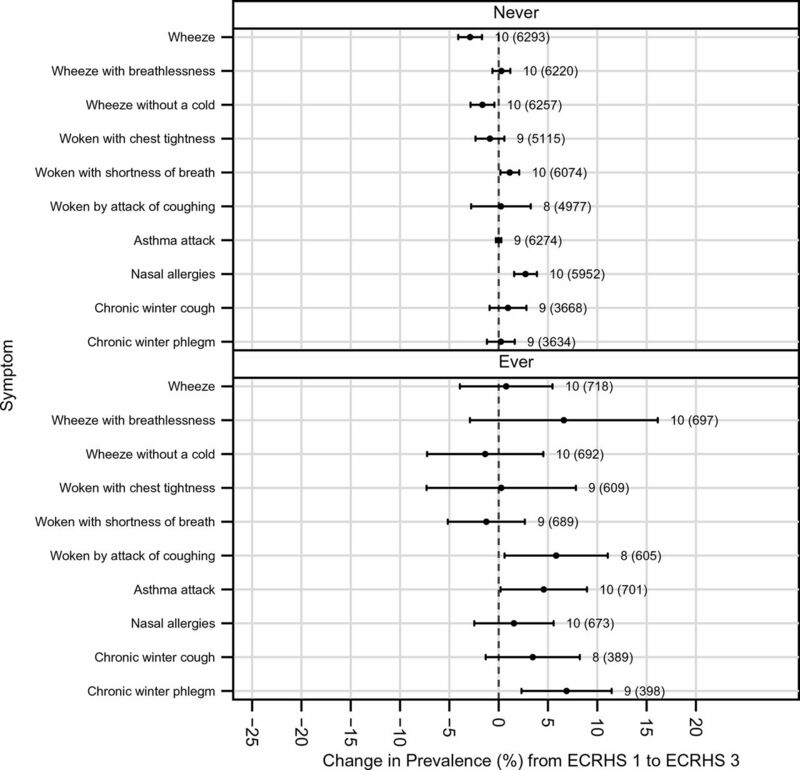 The European Community Respiratory Health Survey II (ECRHS), a large multicentre, predominantly Western European, community-based study of younger adults reported that over a 10-year period (1992–2002) the prevalence of wheeze and wheeze-related symptoms fell among participants, while at the same time, the prevalence of asthma attacks and treatment for asthma increased.1 This pattern of change, which was seen in all participating countries, was hypothesised as due to increased labelling (more ‘asthma’) and increased treatment (less wheeze) in those with relatively mild disease, possibly in response to the widespread adoption of guidelines for asthma treatment during the 1990s. At the time it seemed unlikely that the overall decrease in wheeze symptoms would be related to decreased atopy within the ageing populations, as there was a contemporaneous increase in the prevalence of self-reported nasal allergies, and little evidence of change in measured serum specific IgE in a representative subsample of responders.2 The observed changes in symptom burden may have occurred in response to cessation of smoking with ageing,3–5 driven by improved tobacco control during the 1990s, but at the time of publication information on smoking habits of the study group was still unavailable. The ECRHS has now completed the 20-year follow-up of participants (ECRHS III). Here we describe changes in the prevalence of respiratory symptoms in these adults over the 20-year follow-up period and assess whether observed changes in symptom prevalence are likely to be related to changes in use of asthma medication, changes in a proxy marker for allergy (the presence of nasal allergies) or changes in smoking behaviour. We report our findings adhering to the Standards for Reporting of Observational Epidemiology. In 2000–2002, twenty-nine (of the original 48) centres (14 countries) sent the identical brief questionnaire to all individuals who had taken part in the clinical assessment. The methods and the results1 7–9 have been presented in full elsewhere. In Melbourne the target sample answered identical questions through interviewer administered questionnaire, and in Spain (five centres) questions on hay fever/nasal allergies were administered separately by interviewer questionnaire. From 2008 to 2013, these 29 centres (28 in Europe and 1 in Australia) sent the identical questionnaire to all responders to the postal survey in ECRHS II (Spanish centres; target population consisted of responders to clinical assessment ECRHS II). In centres where administrative records were available, Data Protection legislation permitted and ethical approval was granted, the questionnaire was also sent to those who were eligible for ECRHS II but had not taken part at the time of ECRHS II. Information on smoking was collected during clinical assessment in ECRHS I and ECRHS II, and from the postal survey in ECRHS III. In 26 centres information on chronic winter cough and chronic winter phlegm was collected from the subsample of responders to the clinical assessments at each phase of the survey (chronic cough/phlegm for ‘most days for as much as three months each year’ in the winter). The relevant questions in the postal survey are shown in online supplementary appendix 1. The study flow is described in figure 1. Study flow diagram for participants in the ECRHS III Canada (6) and Poland (1) not included—first data submitted after 1995. Note that ECRHS included follow-up of non-random sample of those selected because they had symptoms—this group is not included in this analysis. ECRHS, European Community Respiratory Health Survey. Absolute (‘net’) change in symptoms per 10 years of follow-up in those who responded to all three surveys was estimated using a logistic generalised estimating equations (GEE) model, with exchangeable correlation and Huber variances.10 As length of follow-up varied between centres, a quadratic reference spline was used11 to estimate the prevalence of symptoms in each population on 1 January 1991, 1 January 2001 and 1 January 2011. Analyses were conducted within centre and estimates combined using random effects meta-analysis12 and the I2 statistic13 used to assess heterogeneity between centres. To adjust for non-response, analyses were conducted using inverse response-propensity weights14 in which ‘response’ was defined as ‘responded to all 3 surveys,’ and response odds determined multiplicatively (using separate logistic regressions in each centre) by age, gender, smoking status (never, ex, current) and reporting of wheeze in ECRHS I. Estimates from these adjusted analyses are presented. Further analyses were stratified by gender (male or female), by age group at ECRHS I (<35 and 35+ years), by use of asthma treatments over the whole study period (never, ever), four smoking groups (non-smoker throughout period of follow-up, smokers at baseline who gave up during follow-up, smokers throughout follow-up and ex-smokers at follow-up with variable smoking history during the study) and presence of hay fever/nasal allergies at baseline. Table 1 shows, by centre, the number of participants in the target sample (responders to the ECRHS I clinical survey), the number who responded to ECRHS II, and of these, the number who responded to ECRHS III. Overall, 53.2% (n=7884) of participants in the target sample completed all three questionnaires over the 20-year period, and 950 (6.42%) completed the questionnaire in ECRHS I and ECRHS III only. Response to all three questionnaires varied by centre (nine centres with response >60% and four centres less than 40%). The mean age at follow-up was 53.0 years with some variation in age at follow-up between centres, explained by a later start in ECRHS I in some centres (eg, Tartu, Estonia). Response to all three surveys was strongly related to being older, a female, a non-smoker and not having wheeze at baseline. Response rates were similar in those with and without diagnosed asthma (those reporting ‘asthma attack’ or ‘current asthma treatment’). Over the 20-year period, the 12-month period prevalence of wheeze and wheeze in the absence of a cold fell (net change in prevalence −2.4%, 95% CI −3.5 to −1.3 and −1.5%, 95% CI −2.4 to −0.6%, respectively). There was no change in the prevalence of ‘wheeze with breathlessness,’ but there was a net increase in the prevalence of asthma attacks, current use of treatments for asthma (see figure 2) and current hay fever/nasal allergies. These observations were consistent across all centres (all pheterogeneity>0.5, all I2=0). Net change in prevalence (%) of ‘current use of asthma medication’ (prevalence at ECRHS III minus prevalence at ECRHS I) adjusted for non-response and estimated by generalised estimating equations No estimate for Melbourne, Australia or Basel, Switzerland, as information on asthma medication use was not recorded during postal survey. ECRHS, European Community Respiratory Health Survey. For the other asthma-like symptoms (waking with chest tightness, being woken by shortness of breath, being woken by coughing) the direction and magnitude of prevalence changes varied between centres (pheterogeneity<0.01, I2>50) with no obvious or consistent geographical pattern (see online supplementary figure E1a, E1b, E1c). Among the participants who completed the clinical survey at each of the three surveys and provided information on symptoms of chronic bronchitis, there were non-significant small increases in the prevalence of chronic winter cough and chronic winter phlegm with some variation between centres (pheterogeneity=0.0027 and 0.019, respectively; I249.1% and 40.1%, respectively: see online supplementary figure E1d, E1e). Changes in symptom prevalence in the first 10 years of follow-up were broadly similar to the changes that were seen in the second 10 years of follow-up (p>0.05, see figure 3), except for hay fever/nasal allergies (increases largely seen in the first, but not the second, 10 years of follow-up) and chronic winter cough (where the opposite was seen). 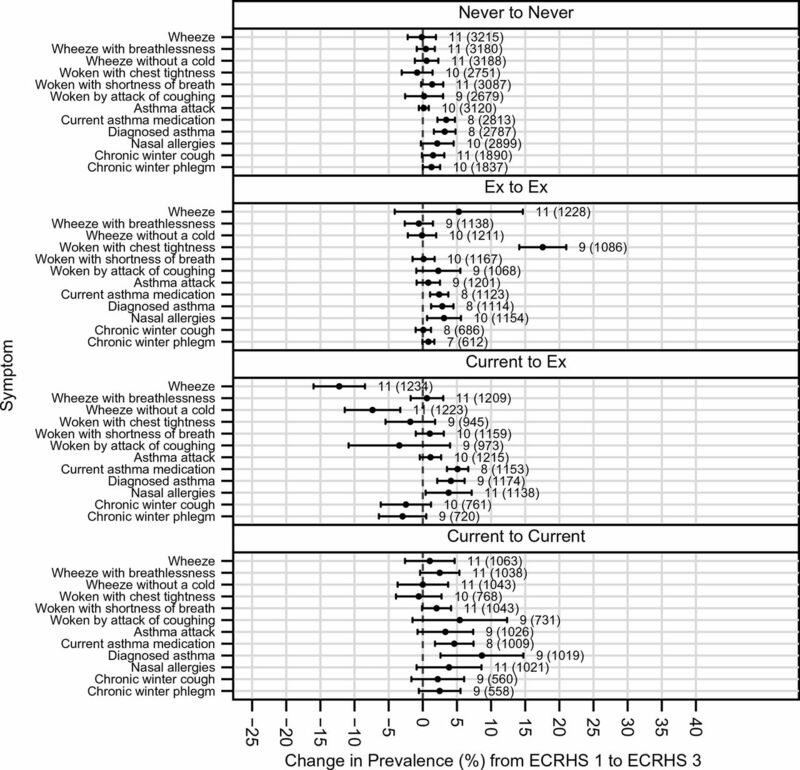 Comparison of change in prevalence in first 10 years to change in prevalence in second 10 years of follow-up (ie, ECRHS III-II change in prevalence minus ECRHS II-I change in prevalence) for all symptoms: adjusted for non-response and estimated by generalised estimating equations. ECRHS, European Community Respiratory Health Survey. Table 3 shows net changes in the prevalence of wheeze, asthma attacks, use of asthma medication and hay fever/nasal allergies (ie, the symptoms that showed consistent patterns of change across all centres) in specific subgroups of the population. Compared with men, women showed smaller decreases in wheeze symptoms and larger increases in use of asthma medication and hay fever/nasal allergies, although the 95% CIs overlapped (eg, net decrease in prevalence of wheeze in men −2.6%, 95% CI −4.2 to −1.1; in women −1.9%, 95% CI −3.6 to −0.3: net increase in prevalence of current use of asthma medication in men 2.5%, 95% CI 1.7 to 3.4; in women 3.9%, 95% CI 2.8 to 5.0). Changes were unrelated to age at the start of the study, except for hay fever/nasal allergies where net increases were greater in those who were younger at baseline (as has been noted at the 10-year follow-up1). The pattern of change in prevalence of wheeze differed by the proxy marker for atopy (reporting of hay fever/nasal allergies at baseline), with greater decreases being seen in those with hay fever/nasal allergies. Net increases in the prevalence of asthma attacks occurred among those who did not have hay fever/nasal allergies at baseline (1.2%, 95% CI 0.8 to 1.7, p=1.6×10−7) and small net decreases, just below conventional levels of significance (−1.5%, 95% CI −3.1 to 0.1, p=0.066) occurred in those who did. During the first 10 years of follow-up the prevalence of smoking decreased (information collected during clinical interview16). It fell further during the second 10 years of follow-up with much larger decreases seen in some countries compared with others (net change in prevalence of active smoking over 20 years, −16.6%; 95% CI −20.3 to −12.9%; I2=89.9%; Pheterogeneity=5.0×10−40; greatest change in Reykjavik, Iceland −37.1%, 95% CI −42.6 to −31.6%; least change in Basel, Switzerland −2.0%, 95% CI −4.7% to 0.8%) (figure 4). Larger net decreases in prevalence of wheeze, and wheeze in the absence of a cold, occurred among those who gave up smoking during the period of the study (figure 5), with a similar pattern of change for chronic winter cough and chronic winter phlegm. Changes in the prevalence of asthma attacks, use of asthma medication and of hay fever/nasal allergies were similar irrespective of smoking history. 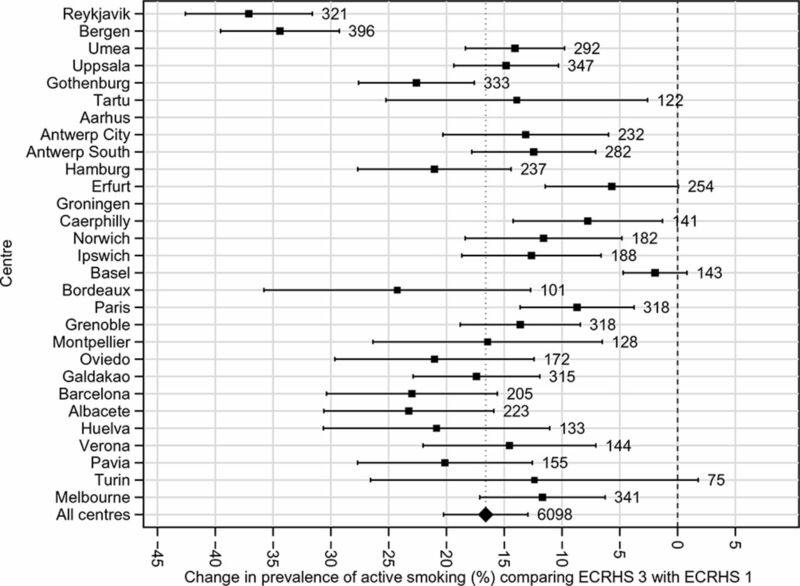 Net change in prevalence (%) of ‘current smoking’ (prevalence at ECRHS III minus prevalence at ECRHS I); adjusted for non-response and estimated by generalised estimating equations in each centre. ECRHS, European Community Respiratory Health Survey. 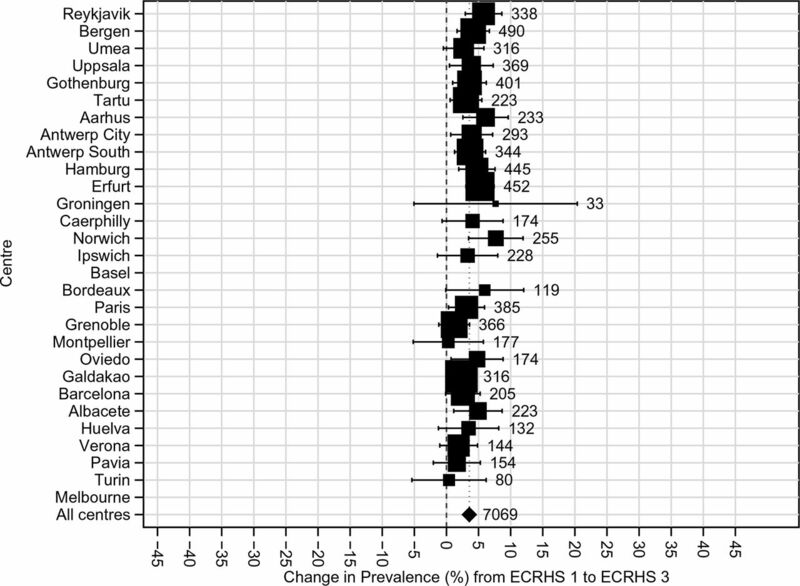 Net change in prevalence (%) of symptoms (prevalence at ECRHS III minus prevalence at ECRHS I); adjusted for non-response and estimated by generalised estimating equations stratified by smoking history. Some differences in numbers of countries for each analysis occur as information on smoking history in some centres differed. ECRHS, European Community Respiratory Health Survey. There was no evidence that those who received asthma treatment at some point during follow-up had greater decreases in the prevalence of wheeze than those who did not receive treatment. The net increase in asthma attacks (and in chronic winter cough and phlegm) occurred almost exclusively among those who had received asthma medication (shown in figure 6, which includes net changes in all symptoms). 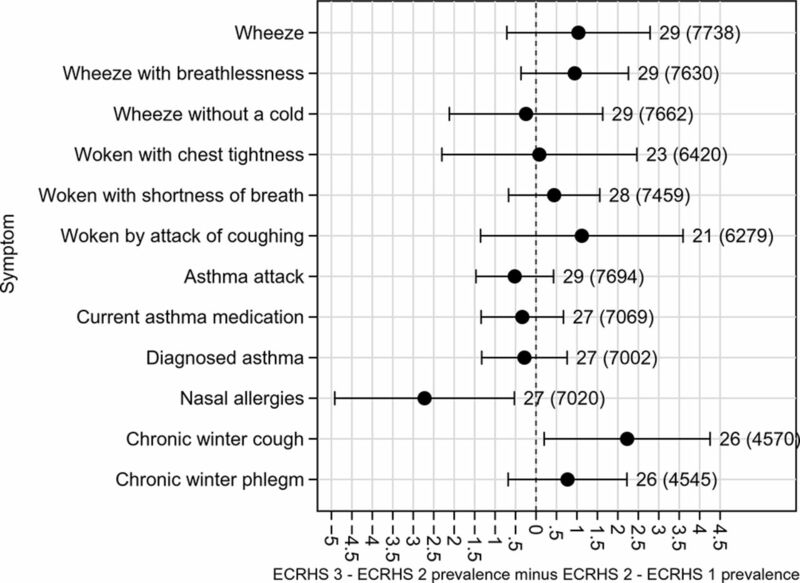 Net change in prevalence (%) of symptoms (prevalence at ECRHS III minus prevalence at ECRHS I); adjusted for non-response and estimated by generalised estimating equations stratified by use of asthma medication. ECRHS, European Community Respiratory Health Survey. Adults taking part in the ECRHS, an international multicentre cohort study, were less likely to report most non-specific respiratory symptoms (predominantly wheeze) as they aged over a period of 20 years, even though, in the same populations at the same time, there were marked increases in asthma, use of asthma medication and hay fever/nasal allergies. This decrease in wheeze symptoms at a group level, which was only seen in those who had never been treated for asthma, is most likely explained by the fall in active smoking as the cohorts have grown older. Changes in atopy may also have had an impact on the natural history of wheeze. Information on the changing prevalence of symptoms in populations of adults as they age has been limited by the relative paucity of large cohort studies of adults with detailed repeat information on respiratory symptoms. The prevalence of wheeze, cough and phlegm increased in 900 Canadian adults aged 20–69 years followed for 10 years (1993–2003).17 Over a similar period, the prevalence of respiratory symptoms (wheeze, cough and asthma) increased in 1000 young (aged 16–34 years) English adults,18 and in Northern Italy the prevalence of asthma, allergic rhinitis and phlegm increased in about 800 participants followed for 25 years.19 In contrast, the Study of Health in Pomerania (SHIP) study (in Germany) followed 3000 adults, aged 20–79 years, for about 6 years (1997/2001–2003/2006) and the prevalence of wheeze, waking with chest tightness and waking with shortness of breath fell (−0.7%, −1.9% and −1.0%, respectively) with some decrease in the prevalence of smoking (from 27.9% to 25.9%).20 Cohort studies such as SHIP20 and others in the UK,21 Norway22 and Chile23 show that change in the prevalence of respiratory symptoms is strongly determined by smoking uptake and smoking cessation patterns in the study populations. Of interest we show that net decreases in wheeze symptoms are greater in those with hay fever/nasal allergies at baseline. In a representative subsample of ECRHS III responders there has been a decrease in serum-specific IgE sensitisation—particularly to house dust mite and cat.34 There was less evidence for decreases in sensitisation to grass, and, consistent with this, here we show substantial net increases in the prevalence of self-reported hay fever/nasal allergies. Possible interpretations of our observations include (1) some of those with symptoms of hay fever/nasal allergies at baseline have become less atopic with fewer wheeze symptoms and (2) those with hay fever/nasal allergies at baseline have received effective treatment of their nasal disorder leading to improvement in respiratory symptoms. Our findings are not contradictory with earlier observations from ECRHS35 showing that hay fever is a risk factor for new asthma onset, but may reflect a lower burden of wheeze symptoms in those with hay fever/nasal allergies as they grow older. Further investigation of these observations is planned within the ECRHS sample with detailed clinical information, treatment information and serial measures of sensitisation (n~3500). Such analysis will be complicated by increases in the prevalence of hay fever/nasal allergies being greater in those born more recently. We observed this at the 10-year follow-up and it is consistent with the observation of cohort-related increases in the prevalence of serum-specific IgE to grass pollen within the ECRHS cohort.34 Furthermore, our observations need to be considered using all the information available from the clinical evaluations, and taking into account the full range of respiratory symptoms. In this report we have reported some data from these clinical interviews that demonstrate non-significant small increases in the prevalence of chronic winter cough and chronic winter phlegm of much lower magnitude than the increases in prevalence of asthma attacks or use of medication. As with all cohorts, the ECRHS has some evidence of systematic loss to follow-up. We have used weighting procedures to account for non-response and our main observations are consistently seen across all centres irrespective of underlying response rates. It seems unlikely that systematic bias in loss to follow-up can account for the patterns we observed. Our report is using information derived from a postal survey on a large sample of adult and information on other relevant determinants of changes in the prevalence of respiratory symptoms (eg, body mass index) is not available. Analyses using information from detailed clinical assessment and incorporating other risk factors are in progress, but inevitably will be based on a smaller number of participants. In conclusion, our study suggests that over the last 20 years, European adults born between 1946 and 1970, who have grown older over the last 20 years, have reduced their smoking and report fewer wheeze-related symptoms. Over the same period, the prevalence of asthma attacks, use of medication for asthma and hay fever/nasal allergies has risen. At a population level, the net decreases in symptoms are explained by smoking cessation. We cannot rule out that changes in atopy with ageing may have also contributed to these decreases.
. Respiratory consequences of light and moderate smoking in young adults in Chile. Int J Tuberc Lung Dis 2006;10:744–9. European Community Respiratory Health Survey. Variations in the prevalence of respiratory symptoms, self-reported asthma attacks, and use of asthma medication in the European Community Respiratory Health Survey (ECRHS). Eur Respir J 1996;9:687–95. European Community Respiratory Health Survey II Steering Committee. The European Community Respiratory Health Survey II. Eur Respir J 2002;20:1071–9.
. The ECRHS: what are the main results so far? Eur Respir J 2001;18:598–611.
. Generalized Estimating Equations. Boca Raton, USA: Chapman & Hall/CRC, 2003.
. Sensible parameters for univariate and multivariate splines. Stata J 2012;12:479–504. Stata . Stata Statistical Software: release 12 version. College Station, Texas, USA: StataCorp, 2011.
. Predictors of respiratory symptoms in a rural canadian population: a longitudinal study of respiratory health. Can Respir J 2011;18:149–53.
. A longitudinal study of changes in respiratory status in young adults, 1993-2001. Int J Tuberc Lung Dis 2007;11:338–43.
. Asthma onset and relapse in adult life: the british 1958 birth cohort study. annals of allergy, Asthma & immunology: official publication of the American College of Allergy, Asthma, &. Immunology 2007;98:337–43. OECD. Health at a glance: Europe. OECD Publishing, 2012.
. Has the increase in the prevalence of asthma and respiratory symptoms reached a plateau in Stockholm, Sweden? Int J Tuberc Lung Dis 2010;14:764–71. Contributors All authors have contributed to the conception or design of the ECRHS or to the acquisition, analysis or interpretation of ECRHS data herein and have contributed to the drafting and revision of the manuscript. The coordination of ECRHS I was supported by the European Commission. The following grants helped fund the local studies. Australia: Asthma Foundation of Victoria, Allen and Hanbury’s, Belgium: Belgian Science Policy Office, National Fund for Scientific Research, Denmark: Aarhus (R Dahl, M Iversen), Estonia: Estonian Science Foundation, grant no. 1088, France: Ministère de la Santé, Glaxo France, Insitut Pneumologique d’Aquitaine, Contrat de Plan Etat-Région Languedoc-Rousillon, CNMATS, CNMRT (90MR/10, 91AF/6), Ministre delegué de la santé, RNSP, France; GSF, Germany: Bundes minister für Forschung und Technologie, Greece: The Greek Secretary General of Research and Technology, Fisons, Astra and Boehringer-Ingelheim; Italy: Ministero dell’Università e della Ricerca Scientifica e Tecnologica, CNR, Regione Veneto grant RSF no. 381/05.93, Netherlands Dutch Ministry of Wellbeing, Public Health and Culture and the Netherlands Asthma Foundation, Norway: Norwegian Research Council project no. 101422/310; Portugal: Glaxo Farmacêutica Lda, Sandoz Portugesa, Spain: Fondo de Investigación Sanitaria (#91/0016-060-05/E, 92/0319 and #93/0393), Hospital General de Albacete, Hospital General Juan Ramón Jiménez, Dirección Regional de Salud Pública (Consejería de Sanidad del Principado de Asturias), CIRIT (1997 SGR 00079) and Servicio Andaluz de Salud; Sweden: The Swedish Medical Research Council, the Swedish Heart Lung Foundation, the Swedish Association against Asthma and Allergy; Switzerland: Swiss National Science Foundation grant 4026- 28099; UK: National Asthma Campaign, British Lung Foundation, Department of Health, South Thames Regional Health Authority. The coordination of ECRHS II was supported by the European Commission. The following grants helped fund the local studies. Australia: National Health and Medical Research Council, Belgium: Antwerp: Fund for Scientific Research (grant code, G.0402.00), University of Antwerp, Flemish Health Ministry; Estonia: Tartu Estonian Science Foundation grant no. 4350, France: (All) Programme Hospitalier de Recherche Clinique—Direction de la Recherche Clinique (DRC) de Grenoble 2000 number 2610, Ministry of Health, Ministère de l’Emploi et de la Solidarité, Direction Génerale de la Santé, Centre Hospitalier Universitaire (CHU) de Grenoble, Bordeaux: Institut Pneumologique d’Aquitaine; Grenoble: Comite des Maladies Respiratoires de l’Isere Montpellier: Aventis (France), Direction Regionale des Affaires Sanitaires et Sociales Languedoc-Roussillon; Paris: Union Chimique Belge-Pharma (France), Aventis (France), Glaxo France, Germany: Erfurt GSF—National Research Centre for Environment and Health, Deutsche Forschungsgemeinschaft (grant code, FR1526/1-1), Hamburg: GSF—National Research Centre for Environment and Health, Deutsche Forschungsgemeinschaft (grant code, MA 711/4-1), Iceland: Reykjavik, Icelandic Research Council, Icelandic University Hospital Fund; Italy: Pavia GlaxoSmithKline Italy, Italian Ministry of University and Scientific and Technological Research (MURST), Local University Funding for Research 1998 and 1999; Turin: Azienda Sanitaria Locale 4 Regione Piemonte (Italy), Azienda Ospedaliera Centro Traumatologico Ospedaliero/Centro Traumatologico Ortopedico—Istituto Clinico Ortopedico Regina Maria Adelaide Regione Piemonte Verona: Ministero dell’Universita e della Ricerca Scientifica (MURST), Glaxo Wellcome SPA, Norway: Bergen: Norwegian Research Council, Norwegian Asthma and Allergy Association, Glaxo Wellcome AS, Norway Research Fund; Spain: Fondo de Investigacion Santarias (grant codes, 97/0035-01, 99/0034-01 and 99/0034 02), Hospital Universitario de Albacete, Consejeria de Sanidad; Barcelona: Sociedad Espanola de Neumologıa y Cirugıa Toracica, Public Health Service (grant code, R01 HL62633-01), Fondo de Investigaciones Santarias (grant codes, 97/0035-01, 99/0034-01 and 99/0034-02), Consell Interdepartamentalde Recerca i Innovacio Tecnologica (grant code, 1999SGR 00241), Instituto de Salud Carlos III; Red de Centros de Epidemiologıa y Salud Publica, C03/09, Red de Bases moleculares y fisiologicas de las Enfermedades Respiratorias, C03/011, and Red de Grupos Infancia y Medio Ambiente G03/176; Huelva: Fondo de Investigaciones Santarias (grant codes, 97/0035-01, 99/0034-01 and 99/0034-02); Galdakao: Basque Health Department Oviedo: Fondo de Investigaciones Sanitaria (97/0035-02, 97/0035, 99/0034-01, 99/0034-02, 99/0034-04, 99/0034-06, 99/350, 99/0034--07), European Commission (EU-PEAL PL01237), Generalitat de Catalunya (CIRIT 1999 SGR 00214), Hospital Universitario de Albacete, Sociedad Española de Neumología y Cirugía Torácica (SEPAR R01 HL62633-01), Red de Centros de Epidemiología y Salud Pública (C03/09), Red de Bases moleculares y fisiológicas de las Enfermedades Respiratorias (C03/011) and Red de Grupos Infancia y Medio Ambiente (G03/176);97/0035-01, 99/0034-01 and 99/0034-02); Sweden: Göteborg, Umea, Uppsala: Swedish Heart Lung Foundation, Swedish Foundation for Health Care Sciences and Allergy Research, Swedish Asthma and Allergy Foundation, Swedish Cancer and Allergy Foundation, Swedish Council for Working Life and Social Research (FAS), Switzerland: Basel Swiss National Science Foundation, Swiss Federal Office for Education and Science, Swiss National Accident Insurance Fund; UK: Ipswich and Norwich: Asthma UK (formerly known as National Asthma Campaign). ECRHS III: The coordination of ECRHS III was supported by the Medical Research Council (grant no. 92091). The following grants helped fund the local studies. Australia: National Health and Medical Research Council, Belgium: Antwerp South, Antwerp City: Research Foundation Flanders (FWO), grant code G.0.410.08.N.10 (both sites), Estonia: Tartu-SF0180060s09 from the Estonian Ministry of Education. France: (All) Ministère de la Santé. Programme Hospitalier de Recherche Clinique (PHRC) National 2010. Bordeaux: INSERM U897 Université Bordeaux Segalen, Grenoble: Comite Scientifique AGIRadom 2011. Paris: Agence Nationale de la Santé, Région Ile de France, domaine d’intérêt majeur (DIM) Germany : Erfurt: German Research Foundation HE 3294/10-1, Hamburg: German Research Foundation MA 711/6-1, NO 262/7-1, Iceland: Reykjavik, The Landspitali University Hospital Research Fund, University of Iceland Research Fund, ResMed Foundation, California, USA, Orkuveita Reykjavikur (Geothermal plant), Vegagerðin (The Icelandic Road Administration, ICERA). Italy: All Italian centres were funded by the Italian Ministry of Health, Chiesi Farmaceutici SpA. In addition, Verona was funded by Cariverona Foundation, Education Ministry (MIUR). Norway: Norwegian Research council grant no 214123, Western Norway Regional Health Authorities grant no 911631, Bergen Medical Research Foundation. Spain: Fondo de Investigación Sanitaria (PS09/02457, PS09/00716, PS09/01511, PS09/02185, PS09/03190), Servicio Andaluz de Salud , Sociedad Española de Neumología y Cirurgía Torácica (SEPAR 1001/2010); Sweden: All centres were funded by The Swedish Heart and Lung Foundation, The Swedish Asthma and Allergy Association, The Swedish Association against Lung and Heart Disease. Fondo de Investigación Sanitaria (PS09/02457), Barcelona: Fondo de Investigación Sanitaria (FIS PS09/00716), Galdakao: Fondo de Investigación Sanitaria (FIS 09/01511), Huelva: Fondo de Investigación Sanitaria (FIS PS09/02185), and Servicio Andaluz de Salud Oviedo: Fondo de Investigación Sanitaria (FIS PS09/03190). Sweden: All centres were funded by The Swedish Heart and Lung Foundation, The Swedish Asthma and Allergy Association, The Swedish Association against Lung and Heart Disease. Swedish Research Council for Health, Working Life and Welfare (FORTE) Göteborg : Also received further funding from the Swedish Council for Working Life and Social Research. Umea also received funding from Vasterbotten Country Council ALF grant. Switzerland: The Swiss National Science Foundation (grant nos 33CSCO-134276/1, 33CSCO-108796, 3247BO-104283, 3247BO-104288, 3247BO-104284, 3247-065896, 3100-059302, 3200-052720, 3200-042532, 4026-028099). The Federal Office for Forest, Environment and Landscape, The Federal Office of Public Health, The Federal Office of Roads and Transport, The Canton’s Government of Aargan, Basel-Stadt, Basel-Land, Geneva, Luzern, Ticino, Valais and Zürich, the Swiss Lung League, the Canton’s Lung League of Basel Stadt/Basel, Landschaft, Geneva, Ticino, Valais and Zurich, SUVA, Freiwillige Akademische Gesellschaft, UBS Wealth Foundation, Talecris Biotherapeutics GmbH, Abbott Diagnostics, European Commission 018996 (GABRIEL), Wellcome Trust WT 084703MA, UK: Medical Research Council (grant no 92091). Support was also provided by the National Institute for Health Research through the Primary Care Research Network. Ethics approval Multiple bodies across Europe on three occasions. Author note Scientific teams: ECRHS I Coordinating Centre (London): PB, S Chinn, C Luczynska†, DJ, E Lai. Project Management Group: PB (Project leader-UK) S Chinn (UK), C Luczynska † (UK), DJ (UK), P Vermeire † (Antwerp), H Kesteloot (Leuven), J Bousquet (Montpellier), D Nowak (Hamburg), J Prichard † (Dublin), RdM† (Verona), B Rijcken (Groningen), JMA (Barcelona), J Sunyer (Barcelona), J Alves (Oporto), G Boman (Uppsala), N Nielsen (Copenhagen), P Paoletti (Pisa). Participating Centres: Australia: Melbourne (MJA, J Kutin), Belgium: Antwerp South, Antwerp Central (P Vermeire, F van Bastelaer) Estonia: Tartu (R. J õ gi), France: Bordeaux (A. Taytard) Grenoble (IP, C Pison), Paris (F Neukirch, R Liard) Montpellier (J Bousquet, J Knani), Germany: Erfurt (H-E Wichmann, JH) Hamburg (H Magnussen, D Nowak), Iceland: Reykjavik (TG, D Gislason) Italy: Pavia (A Marinoni, I.Cerveri) Turin: (M Bugiani, C Bucca, C Romano) Verona: (RdM†, L Cascio, C Campello) Netherlands: Groningen (J Droste, M Kerkhof) Norway: Bergen (A Gulsvik, E Omenaas) Spain: Albacete (J Martinez-Moratalla, E Almar, A Mateos, M Arévalo, A Sánchez, M Vizcaya, X Aguilar, A Teixidó) Barcelona (JMA, M Kogevinas, J Sunyer, F Burgos, J Castellsagué, J Roca, JB Soriano, A Tobías) Galdakao: N Muiñozguren , J Ramos González, A Capelastegui) HKriya v1.08.084 © Exeter Premedia Services (2015)uelva: (J Maldonado Pérez AP-V, J Sánchez) Oviedo (J Quiros, I Huerta, F Payo) Sweden: Göteborg (N Lindholm, P Plaschke) Uppsala:(G Boman, CJ, E Björnsson) Umeå (L Rosenhall, E Norrman B Lundbäck) Switzerland: Basel (U Ackermann- Liebrich, N Küenzli, A Perruchoud) UK: Caerphilly (M Burr†, J Layzell) Ipswich (R Hall) Norwich (B Harrison). ECRHS II Coordinating Centre (London): PB, S Chinn, C Luczynska†, DJ, J Knox. Project Management Group: PB (Project leader-UK) S Chinn (UK), C Luczynska † (UK), DJ (UK), P Vermeire † (Antwerp), J Bousquet (Montpellier), JH (Erfurt), M Wjst (Munich) RdM† (Verona), JMA (Barcelona), J Sunyer (Barcelona) CJ (Uppsala), U Ackermann- Liebrich (Basel), N Kuenzli (University of Basel, and University of Southern California, Los Angeles, USA); F Neukirch (Paris) Participating Centres: Australia: Melbourne (MA, E H Walters, J Raven), Belgium: Antwerp South, Antwerp Central (P Vermeire, JW, M van Sprundel, V Nelen) Estonia: Tartu (R J õ gi, A Soon), France: Bordeaux (A Taytard, CR),) Grenoble (IP, J Ferran-Quentin), Paris (F Neukirch, BL, R Liard, M Zureik) Montpellier (J Bousquet, PJ Bousquet), Germany: Erfurt (JH, M Wjst, C Frye, I Meyer) Hamburg (H Magnussen, D Nowak), Iceland: Reykjavik (TG, E Bjornsson, D Gislason, K B Jörundsdóttir) Italy: Pavia (A Marinoni, S Villani, M Ponzio, F Frigerio, M Comelli, M Grassi, I Cerveri, AC) Turin: (RB, M Bugiani, P Piccioni, E Caria, A Carosso, E Migliore, G Castiglioni) Verona: RdM†, G Verlato, E Zanolin, SA, A Poli, V Lo Cascio, M Ferrari, I Cazzoletti) Netherlands: Groningen (M Kerkhof) Norway: Bergen (A Gulsvik, E Omenaas, CS, B Laerum) Spain: Albacete (JM-MR, E Almar, M Arévalo, C Boix, G González, J M Ignacio García, J Solera, JDamián) Barcelona (JMA, J Sunyer, M Kogevinas, JPZ, X Basagaña, A Jaen, F Burgos, C Acosta) Galdakao: (N Muñozguren, J Ramos, IU, U Aguirre) Huelva: (J Maldonado, AP-V, J L Sanchez) Oviedo (F Payo, I. Huerta, A de la Vega, L Palenciano, J Azofra, A Cañada) Sweden: Göteborg (K. Toren, L Lillienberg, A C Olin, B Balder, A Pfeifer-Nilsson, R Sundberg) Uppsala: (CJ, G Boman, D Norback, G Wieslander, M Gunnbjornsdottir) Umeå (E Norrman, M Soderberg, K A Franklin, B Lundback, BF, L Nystrom) Switzerland: Basel (N Küenzli, B Dibbert, M Hazenkamp, M Brutsche, U Ackermann-Liebrich) UK: Caerphilly (M Burr†, J Layzell) Ipswich (DJ, R Hall, D Seaton) Norwich (DJ, B Harrison). ECRHS III Coordinating Centre (London): DJ, PB, M Tumilty, J PottsProject Management Group: DJ (UK), PB (UK), JH (Erfurt), RdM† (Verona),JMA (Barcelona) CJ (Uppsala), K Toren (Goteburg), T Gislasson (Iceland) T Rochat (Basel), BLeyneart (Paris) CS (Bergen) JW (Antwerp) JPZ (Barcelona) Australia: Melbourne (MA, G Benke, S Dharmage, B Thompson, S Kaushik, M Matheson.Belgium: South Antwerp & Antwerp City (JW, H Bentouhami, V Nelen) Estonia: Tartu (R J õ gi, H Orru) France: Bordeaux (CR, P O Girodet) Grenoble (IP, V Siroux, J Ferran, J L Cracowski) Montpellier (PD, A Bourdin, I Vachier) Paris (BL, D Soussan, D Courbon, C Neukirch, L Alavoine, X Duval, I Poirier) Germany: Erfurt (JH, E Becker, G Woelke, O Manuwald) Hamburg (H Magnussen, D Nowak, A-MK), Iceland: Reykjavik (TG, B Benediktsdottir, D Gislason, E S Arnardottir, M Clausen, G Gudmundsson, L Gudmundsdottir, H Palsdottir, K Olafsdottir, S Sigmundsdottir, K Bara-Jörundsdottir), Italy: Pavia (I Cerveri, AC, A Grosso, F Albicini, E Gini, E M Di Vincenzo, V Ronzoni, S Villani, F Campanella, M Gnesi, F Manzoni, L Rossi, O Ferraro) Turin: (M Bugiani, RB, P Piccioni, R Tassinari, V Bellisario, G Trucco) Verona: (RdM†, SA, L Calciano, L Cazzoletti, M Ferrari, A M Fratta Pasini, F Locatelli, P Marchetti, A Marcon, E Montoli, G Nguyen, M Olivieri, C Papadopoulou, C Posenato, G Pesce, P Vallerio, G Verlato, E Zanolin), Netherlands: Groningen (HMB), Norway: (CS, E Omenaas, A Johannessen, T Skorge, F Gomez Real) Spain: Albacete (JM-MR, E Almar, A Mateos, S García, A Núñez, P López, R Sánchez, E Mancebo) Barcelona:(JMA, JPZ, J Garcia-Aymerich, M Kogevinas, X Basagaña, A E Carsin, F Burgos, C Sanjuas, S Guerra, B Jacquemin, P Davd and Galdakao: N Muñozguren, IU, U Aguirre, S Pascual) Huelva: (J Antonio Maldonado, AP-V, J Luis Sánchez, L Palacios, Oviedo: (F Payo, I Huerta, N Sánchez, M Fernández, B Robles) Sweden: Göteborg (K Torén, M Holm, J-L Kim, A-C Olin, A Dahlman-Höglund), Umea (BF, L Braback, L Modig, B Järvholm, H Bertilsson, K A Franklin, C Wahlgreen) Uppsala: (B Andersson, D Norback, U Spetz Nystrom, G Wieslander, G M Bodinaa Lund, KNisser), Switzerland: Basel (NMP-H, N Künzli, D Stolz, C Schindler, T Rochat, J M.Gaspoz, E Zemp Stutz, M Adam, C Autenrieth, I Curjuric, J Dratva, A Di Pasquale, R Ducret-Stich, E Fischer, L Grize, A Hensel, D Keidel, A Kumar, M Imboden, N Maire, A Mehta, H Phuleria, M Ragettli, M Ritter, E Schaffner, G A Thun, A Ineichen, T Schikowski, M Tarantino, M Tsai, UK:London (PB, DJ, S Kapur, RN, J Potts,) Ipswich: (DJ, M Tumilty, N Innes) Norwich: (DJ, M Tumilty, A Wilson).